Dozens of parents and children were left fighting for their lives after a freak tide surged through a beach. A team of lifeguards dragged more than 30 people to safety after the waves tore sand from under the paddlers' feet at Perranporth, Cornwall. But incredibly lifeguards also had to cope with other visitors leaping into the water despite the obvious dangers. Now, safety teams are demanding extra powers so they can prevent people from heading on to the beach during rescues. Calm water turned into a torrent at the north Cornwall beach on Monday when the flash rip struck at about 1400 BST, as hundreds enjoyed the sunny weather. Nine RNLI lifeguards used rescue boats and boards and a Jet Ski in the biggest rescue seen on one Cornish beach. The flash rip was caused by a movement of sand under the water which means people can suddenly find themselves out of their depth. Although rip currents or tides - strong currents in a limited part of the beach - are common, no lifeguard could recall a previous flash rip at Perranporth. Andy Thomas, RNLI lifeguard supervisor at Perranporth and Perran Sands, said people ignored the red flags on the beach: "It was quite extreme and we had to act quickly. "But people were walking straight past us into the dangerous part of the beach." He added: "If the lifeguards not been at the beach there 's no doubt there would have been multiple drownings - flash rip currents can be lethal." 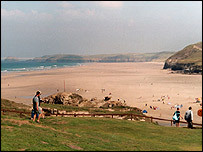 Perranporth, with more than two miles of golden sands, is a popular haunt for locals and holidaymakers with surfing conditions attracting many beginners, but the waters are renowned for their strong currents. Mr Thomas said having more powers would make dealing with dangerous situations easier. He said: "We have to be able to make a firmer approach to people going into a dangerous area."